The Queen of the Rose celebrated a High 5 Casino milestone by inviting players to attend the royal affair and enter the H5C’s 300th Game Celebration Contest! Starting on April 3rd, High 5-ers shared what their royal title would be and how they would impress the Queen of the Rose for a chance to win 300K coins! Celebrating H5C’s 300th game, the Queen hosted a joyous gathering, inviting an elite list of guest from around the world! Reading through these was a royal treat and it is our pleasure to announce and reward the 100 winners! My royal title would be Sir Spins-A-lot and I would impress the Queen by bringing her fair tidings from far away reels, untold winnings from each chapter of chance and fight in her honor. My royal title would be Queen of the Royal Cats and my royal cats would perform breathtaking tricks and daredevil stunts to impress and delight the queen. My royal title would be Lady Judith and I would impress the Queen by baking her the most delicious butter tarts from the butter tart capital of the world! My Royal title would be Princess Rosebud and I would impress the Queen of the Rose by bringing her all the beautiful colorful roses of the world that I could find to show her how much I love roses just like her lovely name and to show her how much I respected the Queen of the Rose 🌹 . The winners are listed below! All winners have received 300K coins for High 5 Casino! To redeem, visit your casino lobby! 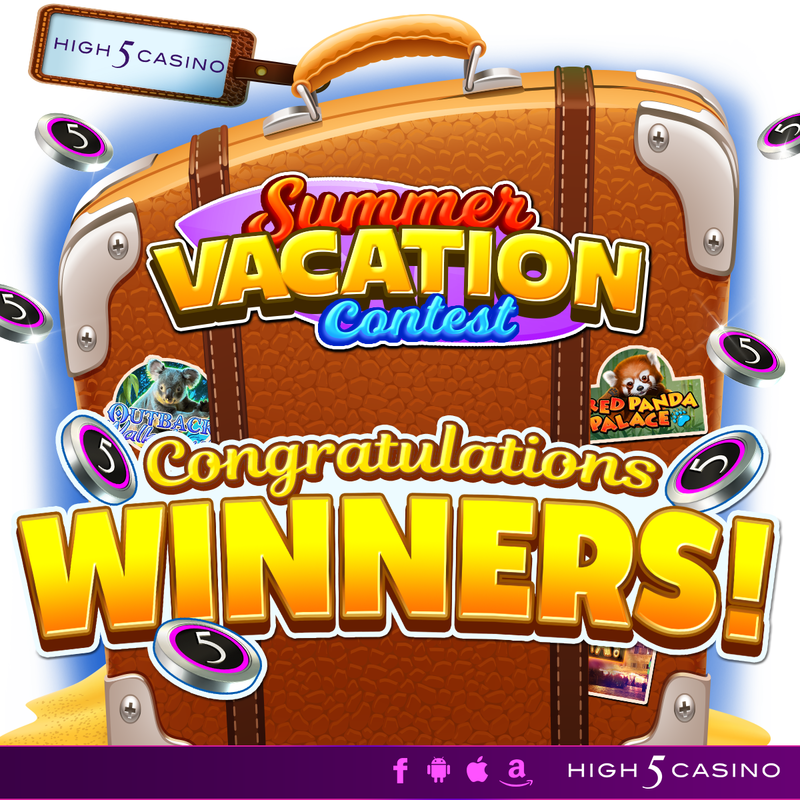 H5C’s Summer Vacation Contest Winners! This year, to celebrate summer, we invited High-5ers’ around the world to enter H5C’s Summer Vacation Contest! If I could vacation in a High 5 Casino slot game, I would travel to Princess Paradise because I feel like a princess when I travel to Paradise Island in the Bahamas. If I could vacation in a High 5 Casino slot game, I would travel to Black Sail Beauties because being a female pirate has always been a fantasy of mine. I would sail to all the other games and play them all. If i could vacation in a High 5 slot game i would travel to CIAO ROMA because Italy is fantastic place to be. If I could vacation in a High 5 Casino slot game, I would travel to Las Vegas because I want to see real casinos! Make sure to check if you are one of the 125 lucky winners today in the list below! All winners have received 200k Free High 5 Casino coins, which can be redeemed in their casino lobby! Congratulations to you all! What kind of contest would you like to see at High 5 Casino? Comment in the conversation bubble located on the top right of the blog post to let us know! Have a beautiful day, High 5-ers! High 5 Casino was sizzling HOT during the month of June! A heat wave rolled into the casino lobby, bringing in FOUR new games, two new tournaments, an exciting variety of themed XP events, and the start of the Back of the Net Tournament! As of the end of June, H5C players can now find a vast variety of 259 slot games in their casino lobby. Slot games added to the library are Lucky Strip, Silver Enchantress, Dino Dollar, and Mayan Macaw. Each new slot game release was followed by a themed XP event, where players enjoyed leveling up their Game Level in selected slots with either 2XP, 3XP, and even 5XP! The XP events were not just limited to only new game weekends. On Sunday, June 17th, High 5 Casino celebrated Father’s Day as High 5-ers rocked out with Double XP in Guitar Kings. Later that week, players’ summer adventure began with Double XP; on Thursday, June 21st, players were able to level up their Game Level two times faster in Aegean Sunset! At the end of the month, players were invited to play High 5 Casino for some Super Saturday fun! 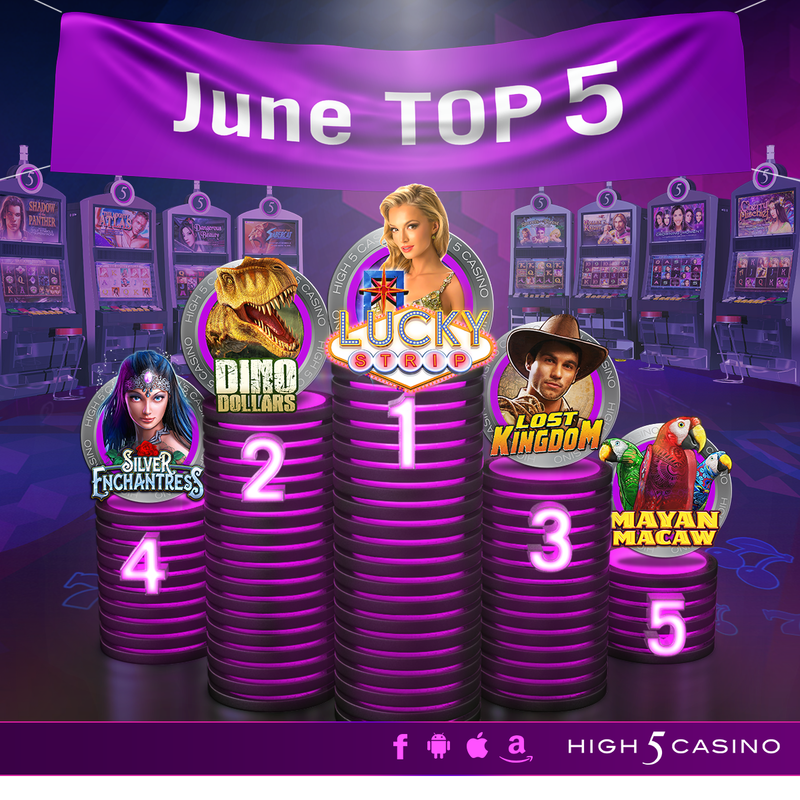 On June 30th, High 5-ers enjoyed increasing their Player Level two times faster by playing in any of the 259 slot games during the specified timeframe for their VIP Tier. June also marked the start of High 5 Casino’s Back of the Net Tournament! Correlating with the start of the current sporting event, High 5 Casino had gotten into the spirit of the upcoming soccer matches with an event of its very own! At the beginning of June, the casino kicked off the soccer-theme tournament, encouraging players to visit the casino’s lobby throughout the month to vote in an in-app pop-up to predict the country of the team they think will win the upcoming match. The players that select the winning team will be able to collect a coin reward after the game. The event started on Tuesday, June 12th and will run until Sunday, July 15th! With all these summer-filled spin-tastic events that June 2018 brought, High 5-ers spent over 2 million hours spinning the H5C reels over 61 MILLION times! Top 5 games played in June: Lucky Strip, Dino Dollars, Lost Kingdom, Silver Enchantress, and Mayan Macaw! Which game gave you your High 5 Moment in June? What did you enjoy most about High 5 Casino last month? How many Back of the Net predictions did you win? Comment in the conversation bubble located on the top right corner of your screen and let us know! The legend is near! 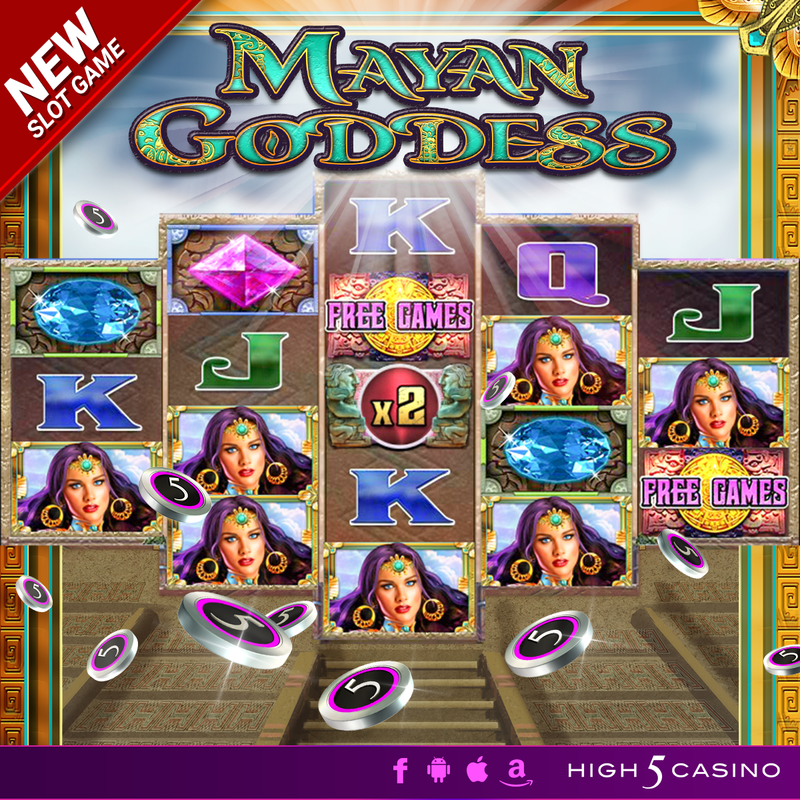 High 5 Casino‘s 251st game, Mayan Goddess, is coming soon! Since the beginning of time, the Mayan deities would come down to Earth to oversee their civilization. Each of them left the citizens of their sacred land the materials to flourish, except one. As the legend goes, one goddess left behind treasures hidden within the depths of an ancient Mayan temple for modern day explorers to discover. The lucky scavenger to find these valuable and unique gems will spend the rest of their days happy and rich! Are you ready to discover Mayan gems in the new H5C game? Comment in the conversation bubble located on the top right corner of your screen and let us know what you think! Celebrate the Year of the Dog! 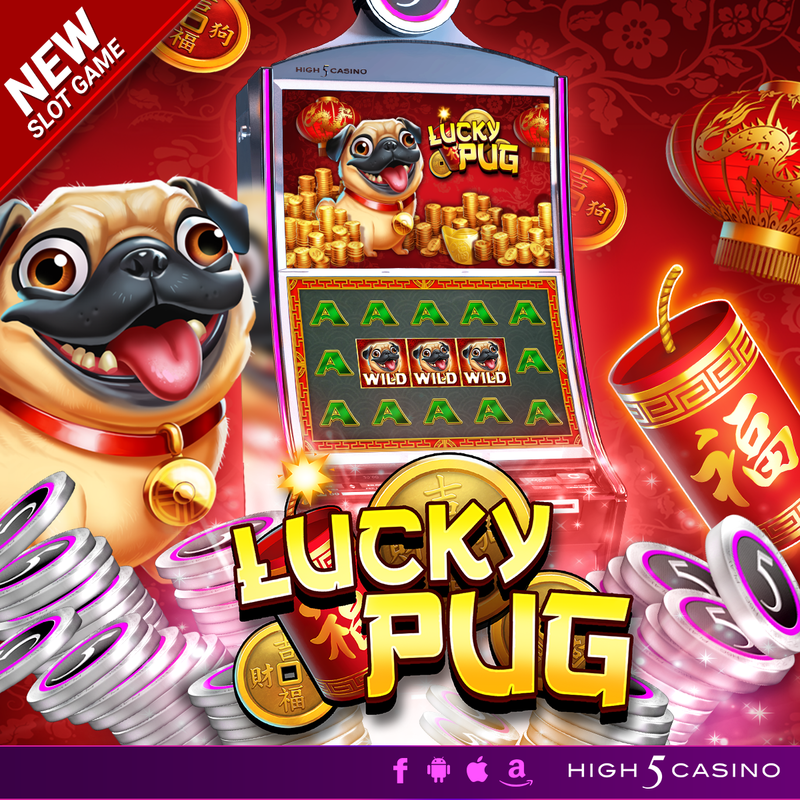 High 5 Casino’s 240th game, Lucky Pug arrives soon! Dogs are more than just a man’s best friend! Ring in the Chinese New Year as we celebrate the year of the dog with the most valued companion around, the pug! Befriend this playful Chinese token of luck and he will give you affection, devotion, and love with adorable big wins! His happy wrinkly face will be your good luck charm during the New Year. Rack up a fortune with Clusterbucks and Free Games in Lucky Pug! Check the YouTube video below and get ready for exciting wins that will make you wag your tail! Are you ready to celebrate the year of the dog? Comment in the conversation bubble located on the top right corner of your screen and let us know what you think! Slot machines are the most popular games in Vegas casinos! 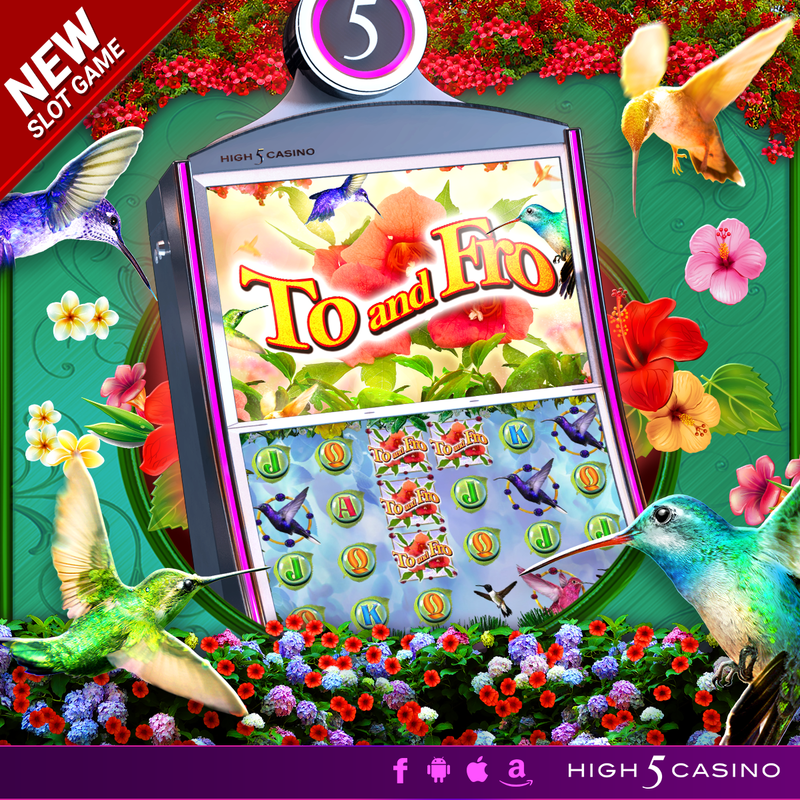 This undeniable love is what brings slot enthusiasts from all over to play at High 5 Casino! Today, at High 5, we want to share a few facts about Vegas and slots with you. Slot machines use random number generators. Early slot machines were mechanical, however, they still used a random number generator. This method is similar to the random number generators of a pair of dice, a deck of cards, or a roulette wheel. Modern slot machines use a computer to generate random numbers, determining the outcome of the games. Anyone who hasn’t played slot machine in a few years, will be stunned to see the changes that are taking place in the game design industry. If you play a game like “Kiss of the Rose”, you will find that you are doing more than just spinning the reels. You are prompted to make choices and interact with the game in many ways. The world’s biggest slot machine was the “Super Big Bertha” measuring in at 2 meters wide and 2.5 meters high. When viewing Earth from outer space, the Las Vegas strip is the brightest place on the surface. For every eight Las Vegas resident, there is one operating slot machine. What kind of facts would you like to know about in the next Slot Factoid blog? Comment in the conversation bubble located on the top right corner of your screen and let us know. Ascend to a higher power! 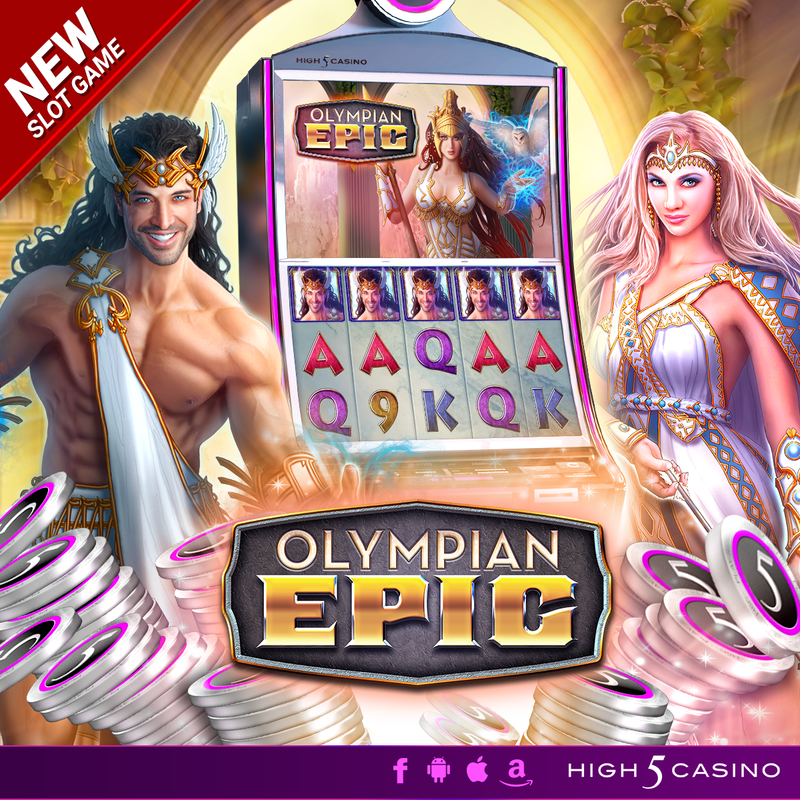 High 5 Casino’s 235th game, Olympian Epic arrives soon! Presiding over every aspect of living mortals are the twelve Olympians residing atop the grand Mount Olympus. Join Zeus’ four youngest children in this exciting slot game as they try to ascend to a higher power. As Hermes, Aphrodite, Dionysus, and Artemis gain their supremacy, the deities will reward you with almighty riches and lively desires. Experience the beauty of love, festivity, travels, and nature in Olympian Epic! Check the YouTube video below and get ready to discover almighty wins! Are you ready to play alongside Mount Olympus? Comment in the conversation bubble located on the top right corner of your screen and let us know what you think! Everyone wins with pumpkin pie on Thanksgiving Day! 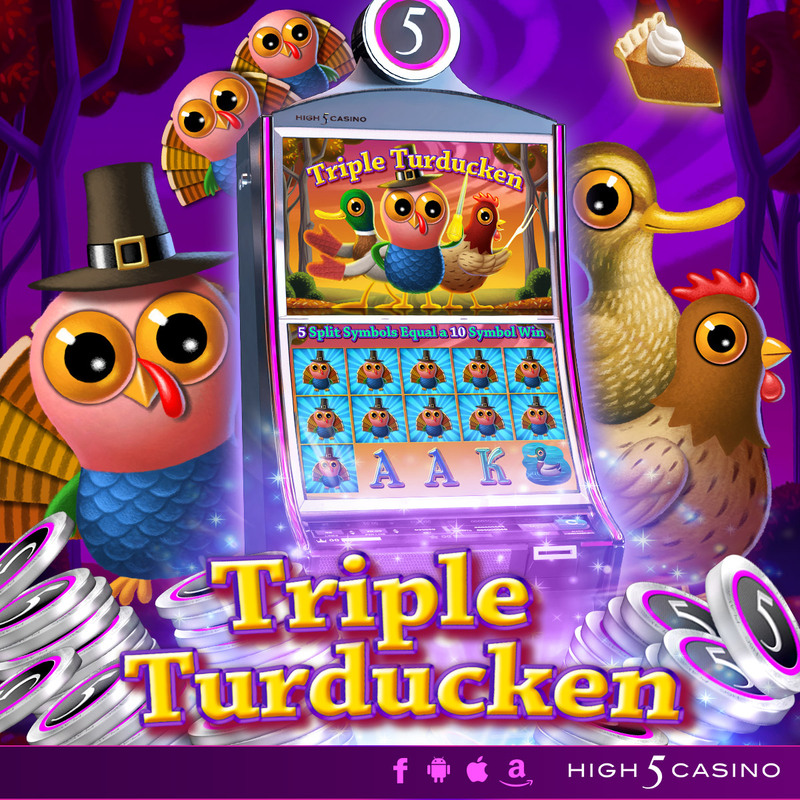 High 5 Casino’s 227th game, Triple Turducken, arrives soon! Check the YouTube video below and get ready endulge in the Pumpkin Pie Pick Bonus! Are you ready to skip dinner and sit down for a dessert filled with pumpkin pie in Triple Turducken? Comment in the conversation bubble located on the top right corner of your screen and let us know what you think! As a lover of ice cream, you are delighted to try out any local shop that dishes out your favorite treat. However, as of so far, you have not found a spot that satisfies your sweet tooth. Therefore, when you discover that two new parlors have opened up in your town, exclusively serving your favorite treat, you know you have to check them out. Which one should you try out first? 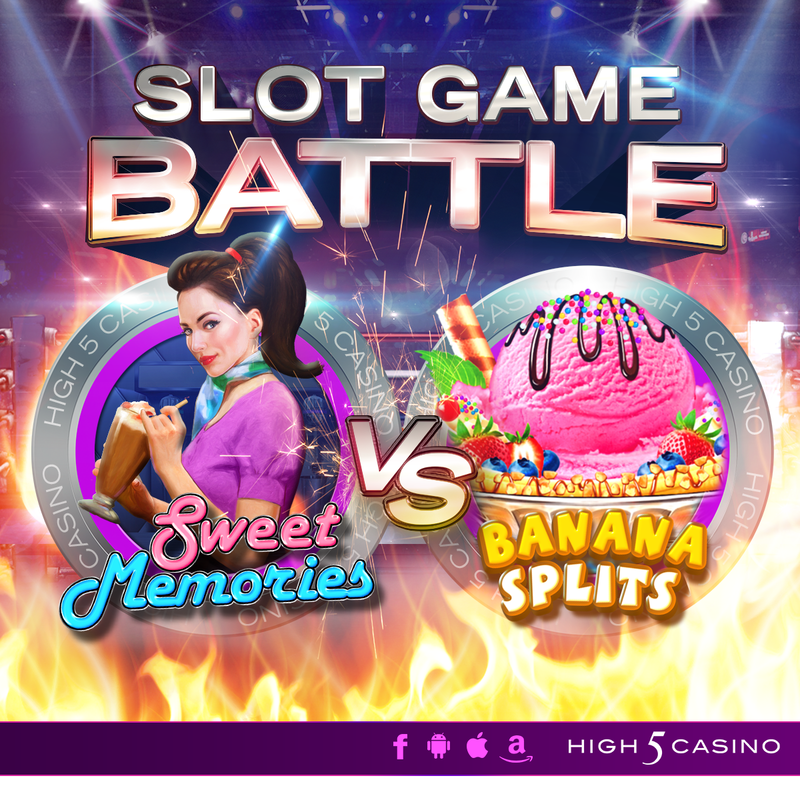 Lucky for you, High 5 Casino can help you figure out which place will satisfy your sweet craving! Head on over to Sweet Memories, for classic music and the richest frozen treats. Here, the desert comes with rock n’ roll courtesy of the grand jukebox that stands proudly in the corner of the parlor. Every waiter is dressed to impress in their 50s best, giving this place a truly unique dining experience. With its nostalgic atmosphere, they hope you will enjoy their signature treat: the milkshake. Choose from classic flavors like vanilla, chocolate or mint, or opt-in to combine them all together for a delightfully filling shake. Nothing can beat this parlor if you want a dessert and a show. If you want your ice cream served with a variety of toppings, Banana Splits is the ice cream parlor for you. This parlor will serve you any ice cream treat you want – all you have to do is ask! Do you want ice cream in a cone, in a sandwich, or as a sundae? They have it all and more! You can pair those treats with classic flavors, or, if you are more adventurous, with their flavors unique to this shop only. Try their titular banana spilt, with hot fudge, star sprinkles, whipped cream, and a cherry on top. You will never be disappointed with the selection here. Which parlor will you choose? Do you prefer a classic milkshake or an over-the-top banana split? Comment in the conversation bubble located on the top right corner of your screen and let us know!